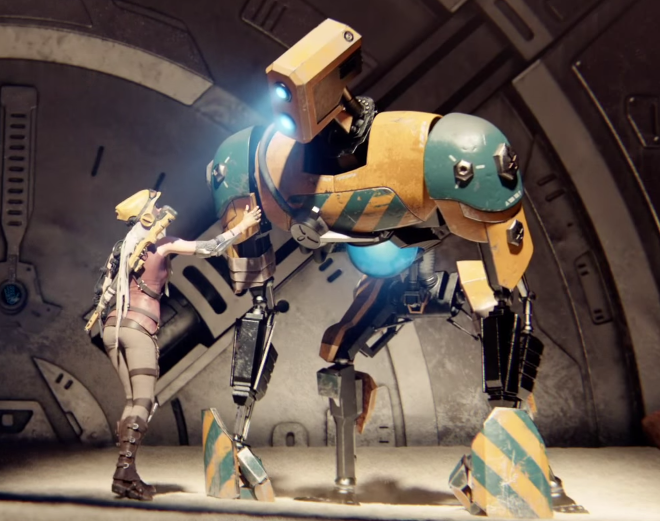 While playing ReCore did you happen to notice each corebot had their own unique sound for their core and the frame? We happened to track down the person who created those distinct sound effects! Read our Q & A with Paul Gorman then at the end, listen to a few of the select sounds he created for ReCore. Before we dive in, can you tell us a little bit about yourself? I’ve been involved in game audio for roughly two decades, and worked in-house as an audio director for many years – in the past, I was at EA on Battlefield, Dead Space, Dante’s Inferno, Lord of the Rings, James Bond, amongst others. I’ve also been a freelancer several times in my career which is what I currently am now – I love being able to collaborate with a wide variety of projects, teams and people. I work out of an independent studio in San Francisco, and am also project partners with Wabi Sabi Sound, who is based in Atlanta, and best known for their recent work on Ori and the Blind Forest. For those who don’t know, what was your role on ReCore? I worked on the companion robots that follow Joule around – Mack (dog), Seth (spider), Duncan (beast), the Flier, and the Tank. The design for each robot features two distinct voices: Frame and Core. Frame is the voice that sounds like what the robot looks like – i.e. the dog frame sounds more or less like a dog, and is directly emotive and reactive to what is happening to the bot on a moment-to-moment basis. Core, on the other hand, is the electronic layer of the robot voice, and is tied to the corresponding core color…if you have played the game enough, you will notice that the three distinct Core voices – blue, yellow, red – are the same regardless of which robot companion they are paired with. The Core voice is akin to the sound of the robot’s internal thought process, like putting a microphone right up next to a hard drive and listening to it clack away while it’s processing data. It’s almost as if the robot is thinking out loud…albeit in their own native language. Blue is low tech and antiquated sounding – a bit like morse code combined with rapid-fire phonetic vowel data. Red uses musical phrases and phonemes. Yellow is high tech and digital sounding, and (once again) combined with phonemes. The “Core” language is also referred as Digimote, which is a common language that all robots can speak and understand. The original design called for Core and Voice to play back at the same time, like a two headed beast with both heads talking at the same time. This, however, turned out to be a tricky idea to put into practice. After experimenting with the design a bit, what seemed to work best was to make sure that only one of the two voices was playing at the same time. In other words, Frame and Core are often played sequentially or back-to-back, which reinforces why one of the voices sounds like external communication, and the other sounds like internal thought. On the visual side of things, the engineering team did an excellent job of getting the robot’s core lights to blink on and off in time to the robot’s voice(s) – I thought that was a great addition! How did you create some of the sounds you made? Many of the sounds the robots were sourced from a Moog Sub 37 synth. The Sub 37 is all analog, but has patch memory so sounds are easily recallable, which is important on a long production cycle where clients might want to revisit the sound of things months after it was first created. Even the mechanical servo sounds for the robots come from the Moog, albeit highly modified. Once the raw synth sounds were captured into ProTools, they went through several more layers of processing. Vowel shapers were heavily utilized, such as Air Talkbox and Sugar Bytes WOW2. I also utilized vocoders to get some of the phonetic effects, such as on the Tank robot. There was also quite a bit of design to make it sound like the voices were emanating from within metallic bodies – like a speaker built deep inside a metal frame. This is usually done with impulse response reverbs and anything else that can sound metallic and resonant. Big thank you to Paul for answering our questions! We pulled a few of the sound effects he made and placed them below. Play them back. Can you name the corebot the sound effect goes to? *Answers – Sound A: Mack in the K-9 frame, Sound B: Seth in the SP-DR frame, Sound C: Duncan in AP-3 frame!